BACKGROUND AND PURPOSE: In neuro-oncology, a major problem is clear identification of tumor from the surrounding normal tissue. We hypothesized that we could use the blood oxygen level–dependent functional MR imaging (BOLD fMRI) signals from tumors and normal brain to identify the tumors and distinguish them from the surrounding brain. MATERIALS AND METHODS: Fourteen patients with meningiomas, gliomas, and metastatic tumors were scanned before surgery. All subjects performed a motor task; 2 subjects were also scanned while in a resting state. The BOLD signals were taken from selected points within the tumor and from the surrounding normal brain and were analyzed by using correlation analysis to determine how closely they were related. RESULTS: The BOLD signals from all of the tumors were significantly different from those in the surrounding normal tissue. In meningiomas and gliomas, selection of a voxel in the tumor for signal-intensity analysis highlighted the entire tumor mass while excluding the normal tissue. The BOLD signal intensity was the same whether the subjects were motionless or finger tapping. CONCLUSIONS: Analysis of the BOLD signal intensity provides a relatively simple and straightforward method for identifying brain tumors and distinguishing them from normal tissue. This approach may be of use in neurosurgery. Blood oxygen level–dependent functional MR imaging (BOLD fMRI) was originally developed to provide functional information based on cerebral hemodynamic responses during the presentation of a stimulus.5,6 The technique uses a gradient-echo imaging sequence with parameters sensitive to the oxygenation level in blood—that is, it reflects changes in the concentrations of oxy- and deoxyhemoglobin. We,7 and others,8,9 have used BOLD fMRI to map motor and other areas to spare eloquent cortex during surgery. Recent advances in functional imaging have reported the use of the BOLD fMRI signal intensity to describe brain activity during pharmacologic manipulation10 and in the absence of activity (ie, at rest11–14). The BOLD signal intensity is dependent on the hemoglobin ratios and perfusion profile of the region under analysis; this is presumably related to its underlying histology and physiology.14–16 Brain tumors are unlike the normal brain; they are a “mix” of cellular and vascular elements and, like many other neoplasms, are highly vascularized.17–19 We hypothesized that the differences in histology between the tumor and nontumor brain compartments would result in different BOLD signals in each compartment. In this study, we focused on 2 questions: Do brain tumors have a unique BOLD signal intensity, and if so, can we use this signal intensity to distinguish the tumor from the surrounding normal brain? 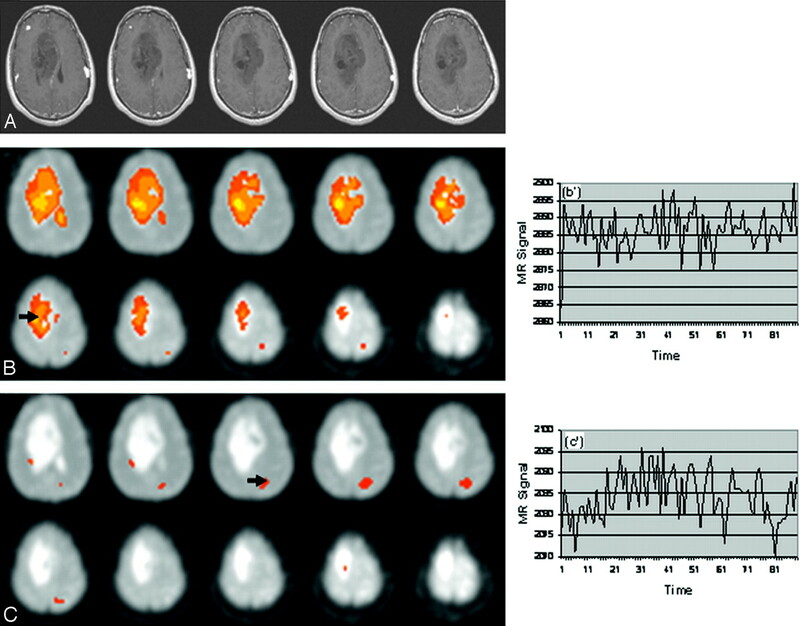 Recent studies have attempted to distinguish brain tumors from normal tissue by using the BOLD fMRI signal intensity; several of these required having animals3,24–26 or patients27 breathe carbogen or other hypoxic gases while blood flow was monitored. A more recent study used the BOLD signal intensity itself to distinguish brain tumors from the surrounding edematous tissue.20 In the present study, we demonstrate that especially for meningiomas and gliomas, the BOLD signal intensity can be used both to identify the extent of the tumor and to distinguish it from the normal tissue. This technique is relatively simple to perform and may be clinically useful. This was a retrospective study of neurosurgery patients who had undergone BOLD fMRI scanning as part of their presurgical work-up and for whom we had histologic data. Fourteen patients (9 men and 5 women; mean age, 48 years) participated in the study (Table 1); 5 patients were diagnosed with meningomas; 6, with gliomas; and 3, with metastatic tumors of varying etiologies. All subjects signed an institutional review board−approved consent form at the time of scanning. The patients with gliomas and meningiomas were scanned from 2000 to 2006; the patients with metastatic tumors were scanned from 1997 to 1999. Because many of the tumors were irregularly shaped, tumor volume was measured radiographically (Table 1). The T1-weighted images were transferred to an Advantage Workstation, Version AW4.2 (GE Healthcare, Milwaukee, Wis); the sections were traced under the volume viewer, multiplied by the section thickness, and summed. The motor area was identified by using a bilateral sequential thumb-to-digits opposition task at 2 Hz (with a metronome). The task paradigm consisted of a 32-second baseline followed by 4 cycles of 30-second finger tapping ON (active phase) and 30-second OFF (no activity). Patients 1 and 6 were scanned for 5 minutes while at rest in the scanner (ie, they were instructed to lie quietly with their eyes closed). BOLD images were acquired on a 1.5T Horizon EchoSpeed scanner (GE Healthcare) with the following parameters: TR/TE, 2000 or 4000 ms/60 ms; FOV, 24 cm; 64 × 64 pixel matrix; section thickness, 5 mm without gap; 28 sections to cover the entire brain. The functional data had a resolution of 3.75 × 3.75 × 5 mm3. Following acquisition of the functional data, a set of 3-mm section thickness high-resolution (256 × 256 pixel matrix size) T1 gadolinium-enhanced images was obtained for functional overlay. The raw datasets were processed off-line by using SPM99 (Wellcome Department of Imaging Neuroscience, London, UK).28 For each subject, the data were aligned to remove the limited motion between datasets, then smoothed with a gaussian kernel (8 × 8 × 10), and normalized before further processing. The first 3 volumes were ignored in the processing due to saturation effects. A threshold of between P < .05 and .01 was selected for each patient. Data were motion-corrected; for head movements between 1–2 mm, the realignment parameters were integrated into the statistical processing as regressors. The T1-weighted images were normalized by using the MNI function in SPM99. The anatomic scans and SPM99-generated maps were used to confirm the location and extent of the tumors. The fMRI data were transferred to a Linux workstation and processed by using the AFNI software (developed by RW Cox in 1996; afni.nimh.nih.gov).29 This program allows the detection of the BOLD signal-intensity time curve from any selected voxel or seed point of interest (VOI). By presetting a correlation level, R, all related signals in the brain are displayed simultaneously; changing the correlation level identifies voxels that are not as closely related to the initial VOI. For each patient, we selected 3–5 tumor VOIs and at least 3 VOIs in the surrounding brain for BOLD signal-intensity analysis. Tumor voxels were selected according to the following paradigm: The first VOI was taken near the center of the tumor; selecting this point displayed the BOLD signal-intensity curve for the VOI and also highlighted all voxels in the brain with a similar signal intensity. Tumor voxels were then selected at different levels; the voxels were taken from the center and from the periphery, and the number of VOIs analyzed depended on the size of the tumor. The nontumor VOIs were selected in relation to the initial tumor VOI. One was taken from approximately the same location in the contralateral hemisphere; 2 voxels were selected from areas adjacent to the tumor at 2 different levels. All voxels were analyzed at high (ie, stringent) R values; the R values were adjusted to maximize the amount of tumor highlighted and to minimize the amount of highlighted brain tissue outside the tumor. These R values were analyzed by the Student paired t test to determine if they were significantly different. The BOLD signal intensity from each VOI was reported as a plot of amplitude versus time (time-series curves). Each VOI signal-intensity curve consisted of 90 time repetitions. Linear regression analysis was used to determine the degree of relationship between the signals (Pearson linear regression, STATISTICA; StatSoft, Tulsa, Okla). In this study, we focused on 2 questions: Do brain tumors have a unique BOLD signal intensity, and if so, can this signal intensity be used to distinguish the tumor from the surrounding normal brain? For the analysis, we used 2 measures of the BOLD signal intensity: the R value (ie, the correlation value that identified closely related voxels) and the BOLD signal-intensity curve itself. Most of our subjects were scanned only while performing the motor task. It was, therefore, necessary to determine first if the BOLD signals either in the tumor or in the normal tissue were affected by the motor task. Once that issue was resolved, we then analyzed the BOLD signals from the tumors and compared them with the signals from the surrounding brain. Effect of the Motor Task on the Tumor BOLD Signal Intensity. To determine if there was an effect of the motor task on the BOLD tumor signal intensity, we analyzed voxels from the tumor and normal brain from patients 1 and 6 while at rest and while performing the motor task (Table 2). For each patient, we selected 1 VOI in the tumor and 1 in the surrounding brain; each voxel was then analyzed under both conditions (Table 2). There was no significant difference in the R values in the resting versus motor activity for either the tumor VOI (P < .03089) or for the normal VOI (P < .0651). We concluded, therefore, that any effect of the motor activity on the tumor signal intensity was limited; therefore, we could use the scans taken during performance of the motor task. The meningiomas and gliomas were easily seen in the anatomic scans (Table 1 and Figs 1A and 2A). The meningiomas ranged in volume from 9.2 to 100 mL, and the gliomas, from 7.87 (grade 4) to 99 mL. For both tumor types, there was no apparent correlation between grade and tumor volume. Patient 1 with a grade I meningioma. Images show the effect of resting state versus motor activity on the BOLD signal intensity. B−E, Seed points in the tumor (B and C) or motor area (D and E) are analyzed during resting or motor activity. There is no difference in the highlighted areas and their signals, whether the VOIs are selected while the patient is at rest or finger tapping. A, Anatomic map. B and C, Correlation map and time series for a tumor seed (arrow) in the resting paradigm (B, B’) and in the bilateral tapping paradigm (C, C’). D and E, Correlation map and time series for a normal VOI (arrow) in the resting paradigm (D, D’), and the bilateral tapping paradigm (E, E’). Arrows indicate VOI seed points. Patient 7 with an oligodendroglioma. Images show identification of the tumor or normal area based on voxel seed points. Selection of a VOI in the tumor does not highlight voxels in the surrounding brain; VOIs in the brain do not highlight voxel tumors. A, Anatomic image. B, Tumor (arrow at VOI: x = 27, y = 26, z = 25) and (B’) BOLD signal intensity at R = 0.9917. C, Normal brain tissue (arrow) and BOLD signal intensity (C’) at VOI: x = 18, y = 16, z = 22) at R = 0.9301. For both tumor types, VOI seed points in the tumor mass, under highly stringent conditions (ie, high R values), highlighted the entire tumor mass (Figs 1B, -C; Fig 2B) while excluding the normal tissue; VOIs outside the tumor excluded the tumor (Figs 1D, -E; Fig 2C). For example, in Fig 2A, the tumor is seen as a large mass. Selection of a VOI in the tumor highlighted the entire tumor but did not identify any related voxels in the surrounding normal tissue (ie, there was no voxel overlap between the tumor and the surrounding normal tissue, Fig 2B). When the selected VOI was taken in the normal area (eg, Fig 2C), voxels in the tumor were not highlighted. The BOLD signals from the tumor VOIs were compared with each other and with the signals from the normal tissue (Table 1). 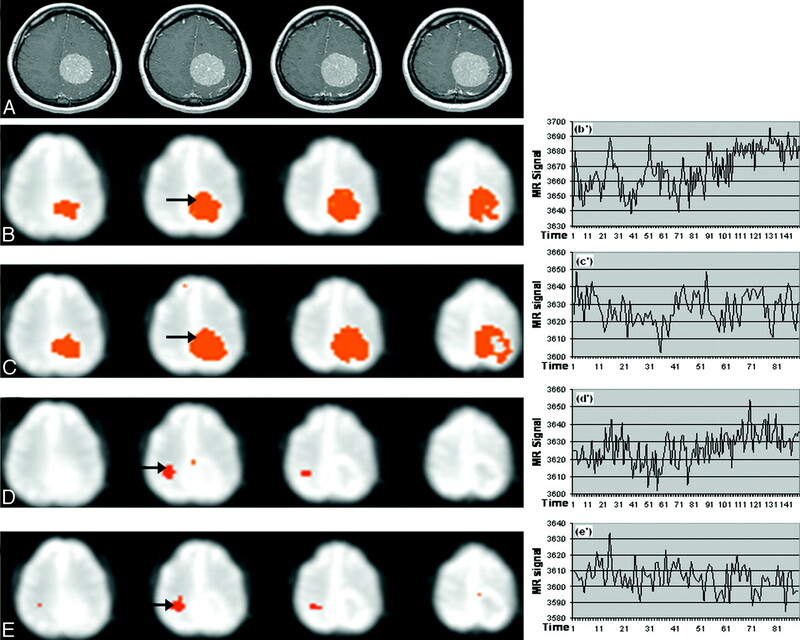 In general, all of the signals within a tumor were highly correlated: For the meningiomas, the mean Pearson correlation coefficients ranged from 0.77 to 0.9; for the gliomas, the coefficients ranged from 0.46 to 0.86. Examination of the data in Table 1 suggests that there was no apparent association of the mean within-tumor correlation coefficient with tumor volume or with tumor grade. Delineation of Normal Tissue from the Tumor. For each tumor, we compared the initial tumor VOI with 3 voxels in the surrounding brain (Table 1, last column). The nontumor seeds were taken from both contralateral and ipsilateral areas within one 5-mm section from the initial tumor seed point. For both tumor types, the correlation between the tumor seeds and the surrounding normal tissue was quite low (Table 1) (ie, the Pearson correlation values ranged from −0.001 to 0.49, whereas the within-tumor signals ranged from 0.46 to 0.92). Similar results were seen by using the R values (Table 1). The differences in the R values between the tumor and normal seeds were highly significant (Student t test): all tumor seeds versus all normal seeds, P < .0056; meningiomas versus normal seeds, P < .0099; and gliomas versus normal seeds, P < .0084. Metastatic Tumors: A Special Case. There were 3 metastatic tumors in our series; these patients were scanned at earlier dates than the patient's meningiomas and gliomas by using a slightly different scanning paradigm (40 versus 90 repetitions). The tumors were heterogeneous in origin; they included a melanoma, an adenocarcinoma, and a highly necrotic tumor of unknown origin (patient 14). The BOLD signals were processed as above. In contrast to the meningiomas and gliomas, VOIs in these tumors did not highlight the entire tumor, even under less stringent conditions. The within-tumor Pearson correlation coefficients for VOIs in the main tumor mass (patients 12 and 13) were 0.83 and 0.97, respectively. Selection of a VOI in the main tumor mass also highlighted voxels in the surrounding brain. There was a significant difference in the R value between the tumor and the surrounding tissue: P < .0375. In patient 12, we identified the motor cortex by identifying the characteristic boxcar signal intensity during finger tapping. A VOI from this area highlighted both motor cortices as well as the supplementary motor area but did not highlight voxels in the tumor (Fig 3). Patient 12 with a metastatic tumor. Images show identification of the motor cortex (heavy solid arrow) during bilateral finger tapping. The motor area is identified from the characteristic signal peaks. Selection of a voxel in the motor area (solid arrow) highlights both motor areas and the supplementary motor area but does not highlight voxels in the tumor mass. The present study describes a new method for identifying brain tumors based on their BOLD fMRI signals. The data show that the tumor signal intensity is significantly different from that of the surrounding brain. This is the first demonstration that the tumor BOLD signal intensity itself, without additional metabolic challenges, can delineate brain tumors and distinguish them from normal brain. This method is reliable, easy to perform, and may be especially useful in presurgical planning. In brief, our results demonstrate that for gliomas and meningiomas, the BOLD signal intensity from a single VOI identifies the tumor but not the surrounding brain. The voxels within the tumors were highly correlated to each other but not to voxels outside the tumor, and to reiterate, there was no association of voxel signal intensity with tumor type, volume, or tumor grade. In this study, we used the BOLD fMRI signal intensity strictly as a diagnostic tool to differentiate the tumor tissue from the surrounding brain; our study did not investigate the signal intensity per se. Others have shown that the BOLD signal intensity is dependent on several factors primarily related to the hemodynamics of the particular tissue. These include the following: vascular architecture15,17,30; blood volume, blood flow, and perfusion19,20,23,31; oxygenation16,21,22; and, presumably, other as-yet-unidentified factors. Traditionally, the BOLD signal intensity has been used to identify areas of the brain that are anatomically discrete but related by function (ie, functional connectivity studies).12,14 The rationale behind those studies, performed while the subject is at rest and not performing a task, is that the BOLD signals in these structures are more closely correlated with each other than they are with signals in nonfunctionally related areas. We reasoned that because a tumor is histologically and metabolically different from normal brain tissue, it should have its own BOLD signal intensity. In our study, there was no effect of resting state or motor activity on the tumor signals (ie, the signals for tumor and nontumor areas were the same whether measured while the patient was at rest or performing a task). Although in our tumor studies, we used the BOLD fMRI signal intensity, our studies are not meant to suggest that the tumor is functionally connected to the rest of the brain. The tumor BOLD signal intensity is known to be affected by a number of hemodynamic parameters, some of which have clinical prognostic value. A study20 of the relationship between tumor blood volume and the amplitude of the BOLD signal intensity in the motor cortex of patients performing a bilateral finger-tapping paradigm showed a significant inverse correlation between the 2 (ie, a decrease in the amplitude of the BOLD signal intensity in the motor cortex with increased tumor blood volume). The effect decreased with distance from the motor cortex, and the signal intensity was unaffected by edema. These authors suggested that the effect on the signal intensity is due to a “stealing” of blood from the active region. These results are similar to those in previous studies from our laboratory7 showing a significant effect of malignant tumors on the activation volume in the ipsilateral motor cortex during bilateral finger tapping; the effect also decreased with distance from the tumor. The BOLD fMRI signal intensity is also affected by both the cardiac and respiratory cycles.37 On the basis of the literature, the effect of the cardiac cycle is seen primarily in areas of the brain that abut large blood vessels38; it has been suggested that this might be a major factor in interpretation of results in studies performed with the patient at rest (eg, during sleep38) and of the visual system.15 In this vein, the effect of the cardiac cycle has been shown to be related to the vascular architecture.30 Tumors often have necrotic centers and make vascular connections along their edges; it would be interesting to replicate this study in animals, where it would be easier to study the BOLD signal intensity in the seed points from the center versus the leading edge. We did not find any strong correlation of the signal intensity among patients with like tumors (ie, similar by type, histology, volume, or grade). For example, grade III gliomas were not more similar to each other than to grade II. Our study has 3 major limitations: the number of patients; the tumor grades of the gliomas; and, finally, the lack of hemodynamic data. Our patient data base was relatively small (14 patients: 5 meningiomas, 6 gliomas, and 3 metastatic tumors). Within the gliomas, there was only 1 patient who had a grade IV tumor, and there were no patients with grade I. We also do not have physiologic or hemodynamic measures for these tumors; therefore, it would be premature to try to relate the BOLD fMRI signals to tumor pathophysiology. Others35,36 have shown that gliomas can be graded by their spin-echo MR susceptibility and blood flow/blood volume. Future studies measuring tumor hemodynamics, coupled with additional patients in each tumor type and grade, and more detailed histology will help to place our results in their proper context. It would be interesting to replicate this study in animals to correlate changes in the BOLD signal intensity with changes in the tumors. Although we had only 3 patients with metastatic tumors, we included them because their results were striking and consistent. We are not aware of comparable studies on these tumors. Although interesting, these results must be considered highly preliminary; additional studies will hopefully yield more information about these tumors. The use of the BOLD fMRI signal intensity to identify brain tumors would seem to be very useful in preoperative strategies but may also be applicable in longitudinal studies in which the decision to operate is complicated by other factors, such as location and size. The results of this study demonstrate the potential utility of the BOLD signal intensity to identify brain tumors. The technique is easy to use and does not require a resting scan, thereby shortening the patient's time in the scanner. Voxels selected from meningiomas and gliomas highlight only the tumor, and their signals are significantly different from those in the normal brain. Meningiomas and gliomas show a relatively high degree of uniformity in their signals, suggesting that the signal intensity reflects an underlying histologic homogeneity. The technique gives a clear idea of the tumor; but it is not obvious if these images show the extent of tumor infiltration. We are also unsure as to whether VOIs in the tumor highlight the edema when analyzed under stringent conditions; others have provided evidence that the signal intensity is not influenced by edema (Ludemann et al20). Future studies, including animal models of tumor growth, should be geared to identifying those physiologic and histologic aspects of brain tumors that are most important in generating their unique BOLD signals. We thank Drs Huey-Jin Lee and Rahul Pawar, Department of Radiology, New Jersey Medical School (NJMS) and Dr Leroy Sharer, Department of Pathology, NJMS, for their help. Accepted after revision August 15, 2008.